Even in this digital age, the business card still has its place in creating a corporate identity. 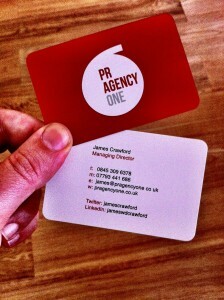 The competitive Manchester PR agency scene is no different and we’ve worked hard on building a brand for PR Agency One. Our new business cards arrived in the post today and the parcel prompted me to write this little plug about Four Design and Paolo Feroleto, who has created the brand guidelines, artwork and supporting marketing literature for PR Agency One. I’ve included a link to his website (see above) but you can also find Paolo and his team on Twitter @four_design, or you can cyber stalk the company’s creative director on LinkedIn. Go and have a look. I think he’s done a good job on PR Agency One’s branding.